Tanzania is a classic African destination that provides the ultimate African wildlife expedition. Nowhere else on the planet does there exist such an incredible volume and diversity of large mammals, while the country also supports over one thousand bird species, many of which are large, bright and colourful, and easy to observe, and with breath-taking scenery thrown into the bargain, Tanzania must surely rank as one of, if not THE best destination for wildlife viewing on earth! Mere mention of the names “Ngorongoro” and “Serengeti” is sure to quicken the pulse of seasoned wildlife travelers and novices alike! In order to optimize viewing opportunities, we use only comfortable safari vehicles, decked with specially designed pop-up roof hatches, and a maximum capacity of six participants during our Tanzanian tours. This means that each participant is guaranteed to enjoy one-on-one tutoring and an unparalleled viewing experience. We are proud to present a thrilling 9 day safari to Tanzania’s world-famous Ngorongoro – Serengeti area while utilizing world-class lodges that have become industry benchmarks in safari elegance and sophistication. Your safari commences in Arusha where the stylish Arusha Coffee Lodge will be “home” for a night, before driving to the Ngorongoro Crater rim and the world – famous & Beyond Ngorongoro Crater Lodge where you can be forgiven for losing track of which era, or even continent, you are experiencing. Nowhere else on earth can you wake up among all the trappings of an elegant baroque chateau – brocade sofas, gilt mirrors, beaded chandeliers and panelled walls – and be instantly transported into one of the most famous African landscapes with just one glance out the window of the lodge. Your final destination is Singita Sabora Tented Camp, which is situated in the Grumeti portion of the Serengeti ecosystem in an untouched wilderness area spanning over 350,000 acres in northern Tanzania. The intimate 1920s-style explorer’s camp is permeated by a sense of nostalgic adventure. 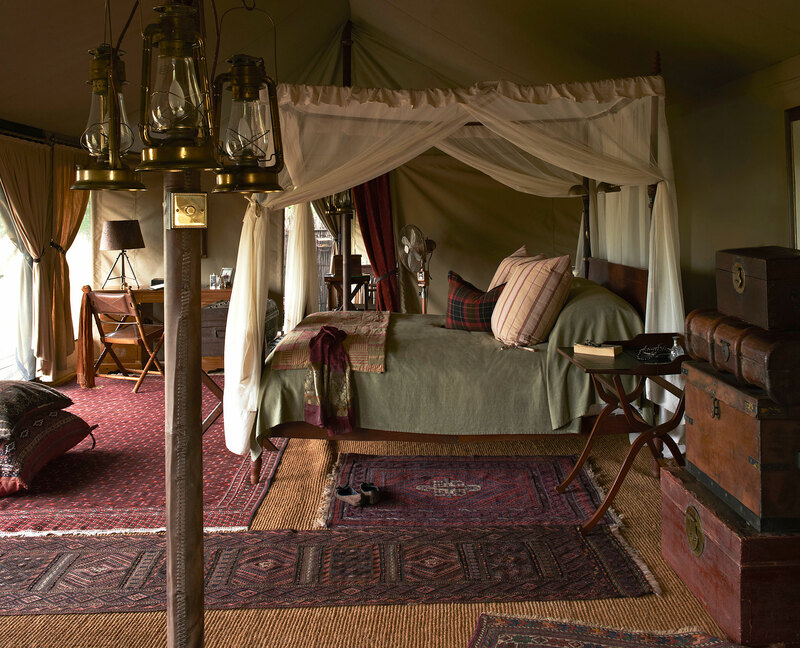 Steeped in character, Singita Sabora Tented Camp surprises guests with an opulence that is delightfully out-of-place with the rugged terrain of the surrounding savanna plains. In combination, the Ngorongoro – Serengeti ecosystem hosts some of the best game viewing and classic African scenery imaginable, so join us on this once-in-a-lifetime adventure that showcases the very best that Tanzania has to offer! Visually stunning Ngorongoro, with its high rim frosted in fluffy white clouds that add a spectacular backdrop to almost every scene! Today is your arrival day in the East African nation of Tanzania, home to the world’s highest free standing mountain (Kilimanjaro), and arguably the most iconic game reserve on earth – Serengeti National Park. After your arrival at Kilimanjaro International Airport, you will be met by an ORYX representative and driven west to your wonderful accommodations for the night located on a large coffee plantation on outskirts of Arusha (the safari capital of northern Tanzania). After breakfast and at a time to be advised we will depart from Arusha to Ngorongoro Crater by road transfer (approximately 3 hours depending on game viewing opportunities). This 8,300km World Heritage Site protects the planet’s largest intact volcanic caldera (approx. 260km), and arguably the world’s most spectacular natural area. Not only is it scenically breathtaking, but the crater is also home to one of the densest populations of large mammals on Earth. 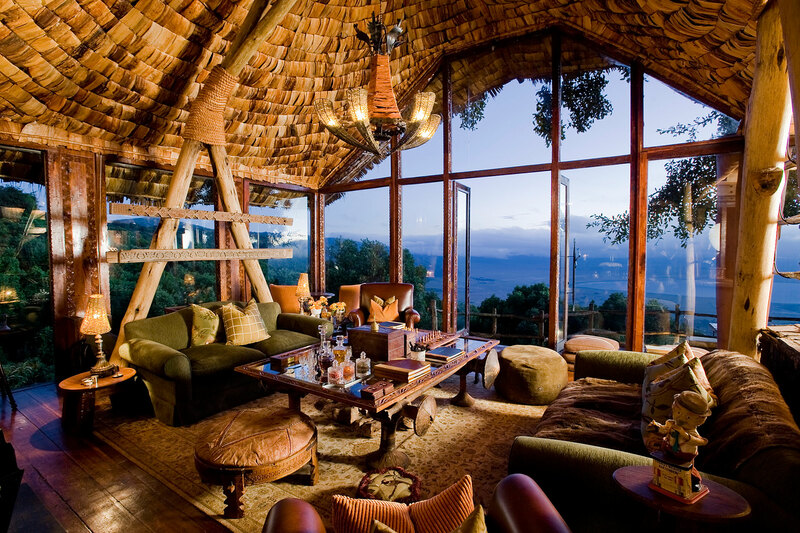 Our luxurious lodge is nestled on the forested edge of the crater rim with spectacular views of the crater itself. For the next 2 days we will descend into the crater floor in our dedicated safari vehicle, a perfect hide in itself! The game viewing opportunities in the Crater are truly world class. Most of the animals here are extremely relaxed and habituated to the presence of humans, while the high crater walls, usually cloaked in a pure white frosting of clouds, make for dramatic back-drops for wildlife viewing. The crater floor provides a mini-example of a complete African ecosystem, with forests, lakes, grasslands, swamps and rivers. Over 30,000 large animals reside here and huge concentrations of Wildebeest and Plains Zebra are supplemented by smaller numbers of African Elephant (mostly large bulls, with many sporting impressive tusks! 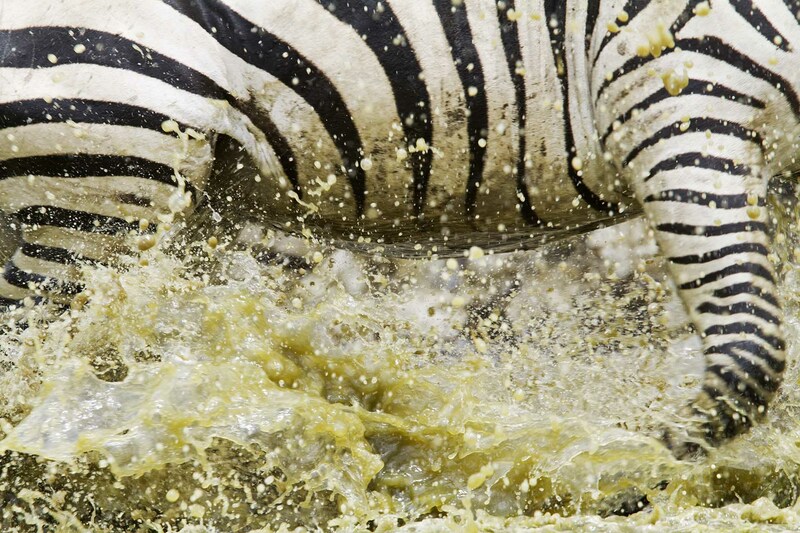 ), the critically endangered Black Rhino, African Buffalo, Hippopotamus, Topi and both Thomson’s and Grant’s Gazelles. A number of Ngorongoro’s Black Rhinos spend the daylight hours on open plains of the crater floor, before returning to browse in the surrounding forest at night. This is of course an unusual trait, as in most areas of Africa, this bruising mammal is typically a shy, “introverted” species that stays for the most part in the thickets and dense brush during the day, only venturing to more open such as waterholes under the cover of darkness. The crater also boasts the world’s highest concentration of predators, and these include Lion, Leopard, Spotted Hyena, Serval, Bat-eared Fox and Golden and Black-backed Jackals. 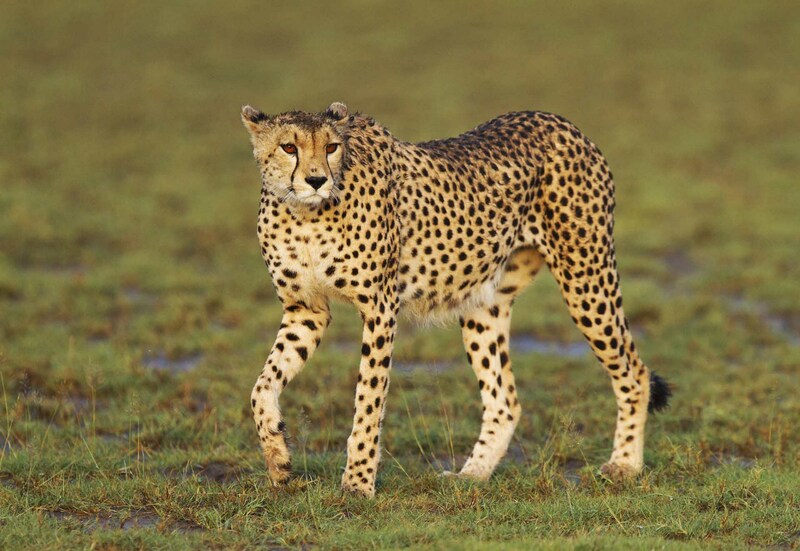 Cheetah, which used to be resident on the crater floor, have recently (within the last 5 years) gone extinct here, and as of yet, no new individuals have recolonized the crater from the surrounding Ngorongoro Conservation Area / Serengeti. We will also have the opportunity to visit a nearby Maasai settlement, known as a manyatta. The Maasai are arguably the most famous tribe in East Africa, and occupy a large area between southern Kenya over the border into northern Tanzania. Traditionally, they were nomadic pastoralists, living off the milk and blood of their much-adored cattle. However nowadays with property ownership, most Maasai live in permanent encampments and are no longer able to relocate to areas of fresh grazing when a currently inhabited area becomes overgrazed, or when parasite levels in the homestead necessitate a move. The Maasai are a regal people – tall, athletic, with stylish hairdressers, wrapped in thin blankets dyed powerful reds and purples and bearing long spears and sticks used to protect their livestock from marauding animals and raids from enemy tribes. They are an iconic part of this landscape, and our visit will provide a fascinating insight into a culture that is being strongly influenced by the modern world, and yet in some areas, clings tenaciously to the traditional ways that have made the “Maasai” a household name. This morning, after breakfast and some final relaxation around the lodge, we will depart to Manyara Airstrip (approximately 1 hour’s drive) in time to check in for our charter flight to Singita Sabora. Upon arrival, we will be met and transferred to our fabulous tented camp. Singita Sabora Tented Camp is situated in an untouched wilderness area of the Singita Grumeti Reserve, spanning over 350,000 acres in northern Tanzania. Singita Grumeti offers an unparalleled eco-safari teeming with magnificent wildlife encounters on the western corridor of the Serengeti. This vast private concession comprises an exclusive trio of luxury lodges positioned ideally on the epic migratory route traversed annually by more than a million wildebeest, providing both solitude, exclusivity and a world-class game viewing experience for the discerning traveller. Singita Grumeti, situated adjacent to the Serengeti National Park in Tanzania, is an integral part of the Serengeti-Mara Ecosystem. 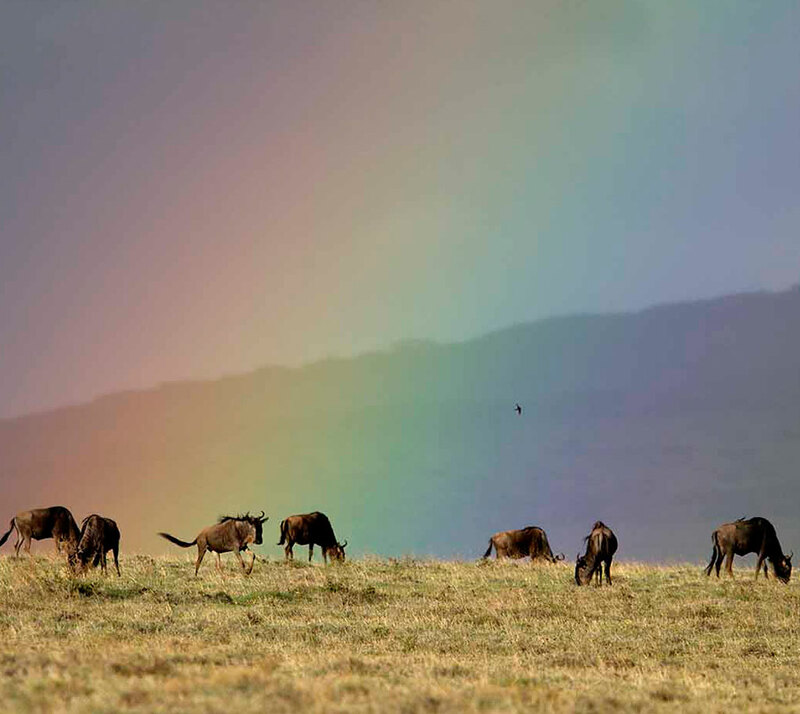 The reserve was proclaimed by the Tanzanian government in 1994 in order to protect the path of the wildebeest migration in addition to the biodiversity of this vast and important part of the ecosystem. 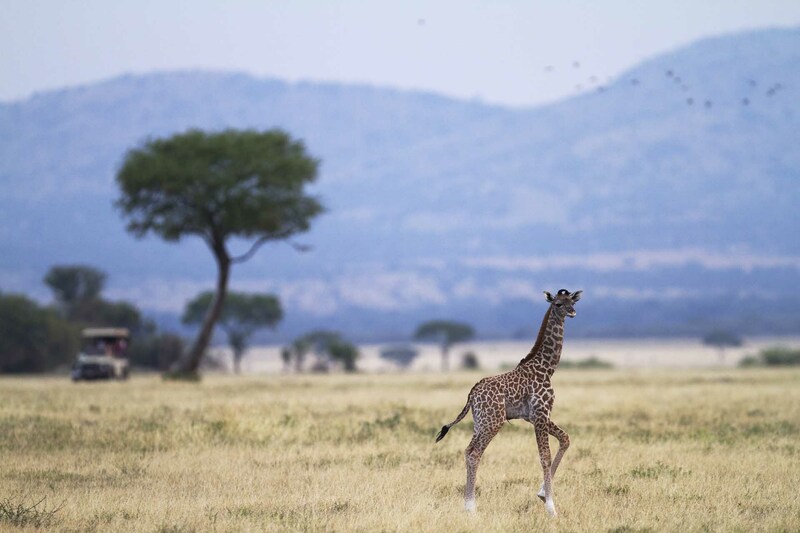 In 2002, the Singita Grumeti Fund, a not-for-profit organization, was granted the right to manage and conserve these 350,000 acres for the benefit of Tanzania, Africa and the world. The famous Great Migration, an annual trek of around 2 million animals through the Serengeti-Mara ecosystem, bisects the reserve annually. Called “The Greatest Wildlife Show on Earth” it has, since time immemorial, been a key feature of this spectacular wilderness. The successes of conservation have ensured that, since its inception in 2003, Singita Grumeti has a maintained a healthy resident game population within the area. In addition to the annual wildebeest migration some notable highlights include large mixed herds of Impala, Plains Zebra, Topi, Eland and Grant’s and Thomson’s gazelle. Good numbers of Bohor Reedbuck, Defassa Waterbuck, Kirk’s Dik-dik, Klipspinger, Oribi and Coke’s Hartebeest are to be found and large breeding herds of Cape Buffalo, up to 400 strong, compliment the numerous small bachelor groups of bulls. Herds of Elephant number up to 450 – concentrations seldom seen elsewhere in Africa. After our final game drive and breakfast, we will board our flight destined for Arusha Airport, where this remarkable journey will sadly come to an end!